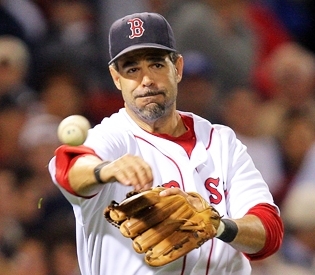 Recently, on a post on Metsblog.com, I learned that the Mets are exploring the possibility of a trade that would send Luis Castillo to the Red Sox for Mike Lowell. Also in the post, it states that in Lowell’s career he has only played Second and Third Base……. Doesn’t this just happen to light a spark in your head that says STAY AWAY? We are already dealing with an inexperienced first basemen that is still attempting to learn the position. We do not need an almost 35 year old, INJURED, Red Sock being traded over to our team, even if that means we’d dump Castillo. Another thing that was killing me about this idea was the fact that Lowell is still owed 12 million for next year. Luis Castillo is owed that over the next two, and even if the Red Sox paid 3 million of that money, the Mets still should avoid Lowell. If the Mets are really concentrated on dumping Luis Castillo, they should look elsewhere. I’d suggest somewhere with a starter we can get in exchange or maybe even a NATURAL first basemen that can mentor Murph. I only believe Lowell is another problem that this team does not need, not to mention he is very vunerable to an injury which the Mets need to stay away from this year. If Lowell is ever to be discussed in a Mets trade, I sure do hope it is a three way trade that dumps Luis out of here and sends Lowell somewhere else. I highly doubt that is going to happen, but its great to think about. I dont think we can find a third partner for that trade to happen, but who knows, Omar may have something up his sleeve.